Who is Abel Carlevaro? In a letter to Mario Castelnuovo-Tedesco from the late 50's Segovia writes:"...three of the guitarists contending for first prize in Geneva are among my best students: the Spaniard Narciso Yepes, the Venezuelan Alirio Diaz, and the Uruguayan Abel Carlevaro." Longitudinal, transversal and mixed presentations, lever and pivot are only a few of the many terms introduced in the guitar technique lexicon by the Uruguayan Maestro Abel Carlevaro in his revolutionary book on technique Escuela de la guitarra (School of guitar). I can still remember the articles that appeared in the specialized guitar magazines in the mid 1980s, when the English version of the book hit the US guitar scene. Some depicted the book as “illuminating,” others described it as “unorthodox”...one thing is certain, nobody was indifferent to it. Who is Abel Carlevaro? 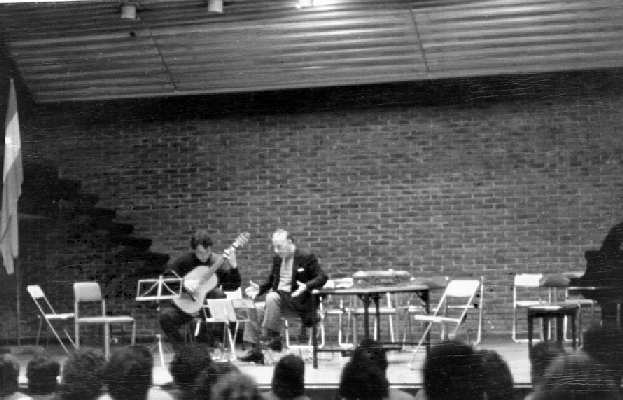 In a letter to Mario Castelnuovo-Tedesco from the late 50’s Segovia writes: “ ...three of the guitarists contending for first prize in Geneva are among my best students: the Spaniard Narciso Yepes, the Venezuelan Alirio Diaz, and the Uruguayan Abel Carlevaro." Getting to know Montevideo and the Uruguayan musical scene is very important when one tries to understand how and why a musician of Carlevaro's stature approached guitar playing in such a scientific and universal way. At the beginning of the 20th Century, Uruguay was often referred to as the “South American Switzerland.” A solid economy, plus a strong imperial English hand, left their mark in many of Uruguay's customs and way of life. Top European immigrants at the turn of the 19th Century gave Montevideo and Uruguay in general, a character that is simply non-existent in neighboring Argentina or Brazil. The illiteracy level in Uruguay is almost zero. That says a lot, especially when it is often generalized that all of South America was considered sparsely literate at best. From 1933 until around 1950, the River Plate region underwent a period of prosperity unknown in the Southern hemisphere outside Australia. It was during this golden era that Andrés Segovia arrived in Montevideo. When Segovia started to teach Carlevaro, the Uruguayan guitarist was already an outstanding guitar player. While people and artists in general were suffering the consequences of a war tormented Europe, South America was offering the ideal surroundings for growth and expansion and prosperity. The guitar world saw Agustin Barrios Mangoré and Abel Carlevaro shaping the instrument and its repertoire, and composers like Villa-Lobos and Ponce were adding to the immense palette of talents that were giving a great and much needed push to the guitar. Consequently, Segovia joined in and spent 10 very prolific years in Uruguay. Only the River Plate flirtation with military dictatorships could reverse this golden era. The region is still paying dearly for this sin. Besides the fertile South American guitar scene in which Carlevaro was growing as a musician, the other key factor that contributed to his future greatness was his unique reaction to the general stagnation of guitar techniques and construction that had been prevalent for many years. You see, the world musical scene was still “adjusting” for having witnessed the inducement of the guitar in the elite classical music scene. The guitar was meant to be played as Segovia did. Tomás’ 8 strings guitar, Yepes’ 10 string and Carlevaro’s two guitars in one system had to wait. No other guitar player before or after Segovia has ever been world famous. Segovia had a lot to do with this. Therefore, it is fair to say that after Segovia’s huge accomplishment to establish the guitar as a “respected classical instrument”, the next great goal to be achieved was to make the world understand that Segovia’s was a “personal interpretative style”. One that dominated the guitar scene for almost a century. There were many questions left unanswered though, and voices that had been shut for many decades were finally beginning to be heard. That explains why many guitarists chose to go to Montevideo and work with Carlevaro... or to Alicante to work with Tomas or Las Rosas to work with Yepes. I had the honor and priviledge to work with the three of them and the one that faith had in mind to deeply influence me was Abel Carlevaro... the people who recommended him as “the right teacher for you” were people I trusted and respected. One of my teachers, the Spanish Jose Tomás, and the guitar builder Manuel Contreras. They were practical people. They knew what they were talking about. After showing me 20 guitars in his Madrid Studio and seeing that I was not particularly enthusiastic about any of these instruments, Manuel Contrereas told me: “ Wait a minute”. He headed towards the staircase that led to the underground studio and came back with this strange looking guitar and told me “Try this”....I started playing up and down the fingerboard and the sound on this instrument was simply beautiful and different...I was hooked. I asked him: “What is this?” and he replied “It is a guitar designed by the Uruguayan guitarist Abel Carlevaro...this one I am building for him...Carlevaro is genial” . Ten minutes later I ordered one and asked Contreras to give me Carlevaro’s phone number. The way this guitar was built can be resumed like this: “Imagine building a guitar inside another guitar. The vibrating instrument -the inner one- is free to vibrate fully because it is not being dumped by the body”. On the other hand, José Tomas, knowing I was making a big effort to stay in Europe and away from my family told me: “Renato, haven't you considered studying with Abel Carlevaro. The man lives in Uruguay (Uruguay is 600 miles South of Paraguay) and he is a great teacher”... Now, isn't life a piece of work?! Here I am in Europe, 10,000 miles from home, making a huge economical and emotional effort, running after 92 year old Segovia to hear him say “I was a guitarist from long before I was born”....or “ I felt the roundness of the Earth under my feet”...when what I really needed was a master to tell me “You pluck the string like this and you lift the finger like that” and the amazing thing was that this master was only 600 miles from home !!!. Empathetic nerve cells also known as mirror neurons are being studied closely by top scientists at the Medical University of Lübeck, and the Parma University Neuroscience Department. Top scientists at these scientific centers have proven that the same cells of the brain are stimulated when we see movement, when we think of the movement and when we emulate the movement. Carlevaro’s famous quote: “I'd rather think for 5 hours and work for one than vice-versa” acquires more validity than ever. His whole school is based on allowing the mind to process every movement on the fretboard in the brain before the actual movement is executed. Carlevaro stressed that guitar players could rely on more than a set of muscles to achieve a given task and that it was the artist's responsibility to use the most apt set of muscles for any given job. This is the theory behind the concept of “fijación” a concept which considers the annullation of certain larger or smaller muscle groups, in order to achieve specific types of sounds and movements. Carlevaro did not leave anything to chance. If he could think of something, it was just a matter of time before he found a way to achieve it. One of the greatest days in guitar history is the day Carlevaro found the way to eliminate left hand squeaking on the guitar caused by the left hand fingers on the fret board; a phenomenon that too often is ignored by guitarists, with little care for the anti aesthetic and disturbing reaction it can produce to the listener. When other instrumentalists hear us, they usually wonder how can we stand ourselves with all that "noise" that, certainly, could not possibly be part of the music. The reason is simple: many guitar players simply ignore string noise. Their brain learns to not hear them... -selective hearing-. There is no other explanation. Simply imagine this line of thought: “I play the C softly, then I squeak over the fifth string and finally play the E gently”. Impossible! Consequently, the following is how many guitarists think: “I play the C softly, then I ignore the ugly squeak over the fifth string and finally play the E gently”. "How can I eliminate these noises?," I would ask Carlevaro..." and he would reply: "First tell me, how do you produce them? Because you do "them" so nicely that I suppose you must have practiced "them" for hours !" The worst part about not being able to eliminate left hand noises, was that I did not even know how I produced them in the first place, therefore, finding a way to eliminate them was actually two problems in one. He made me look into my left hand movements in slow motion and then would ask: "What would you have to do in order to eliminate that squeak?"... I would look again at my left hand in slow motion... and before I knew it I had the answer(s) or at least some of them. He would then proceed to guide me through the rest. That was Carlevaro's teaching. Think, think and think again. The outcome was obvious: you would be making your own technique one musical passage after the other. Regarding pieces, he emphasized that you learn technique through the repertory and not the other way around. In other words, you chose the repertoire according to your personal musical taste, when a given challenge appears, you make your own exercise. Technique is a creative process. Every single technical difficulty was thought over and over and, from the brain, the answers would come and translate into movements on the fret board. One would be terribly disappointed to think that Carlevaro had answers to technical problems or that he would get into technical jargon. He actually had questions and more questions to pose and, in the process, the answer simply stood out. I translated simultaneously for Carlevaro in several occasions during conferences he dictated in Latin America and the only time I was not completely clear on his thoughts and ides, was when he started philosophizing about music, and the role of the guitar in world events...his technical concepts were never hard to understand...let alone translate. When examining players wasting so much energy compensating for the anatomically wrong postures, Carlevaro used to simply say:- "They would play much better and for longer, with better, more natural postures." Carlevaro had taken the time to study the physics and anatomy involved in playing. His technique is among the few that has gone that far, and, he passed his knowledge to his students. Talent can make up for a lot of defects, but I have known quite a few guitarists who had to abandon their careers due to serious injuries that originated in a faulty sitting position. Europeans, South Americans and Asian players flocked Montevideo and literally followed Carlevaro from one masterclass to the next. Most certainly, many US players made the pilgrimage to Uruguay in the 80’s and 90’s to study with Carlevaro in person and the reason was a very simple one: when you studied with him, you discovered yourself, the only one who would play great for you. I recommend you do the same: Think, think, think. Renato Bellucci, article published on GuitArt International, January/March 2004.